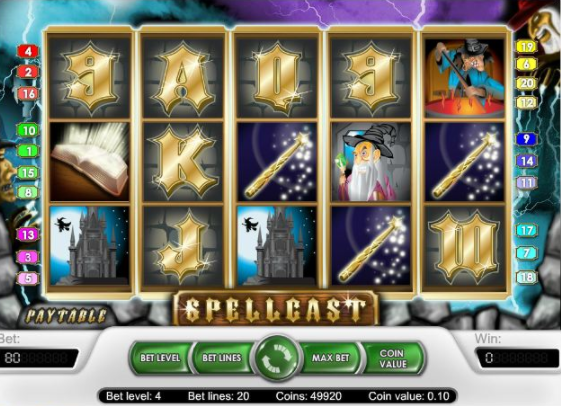 Experiment with a range of ingredients to concoct the perfect potion in this online magical 5 reel slot. This video slot game features 25 paylines of bubbling symbols, letters and Wilds that will have you absolutely spellbound amid the witching hours. One of the best slot games you'll play. 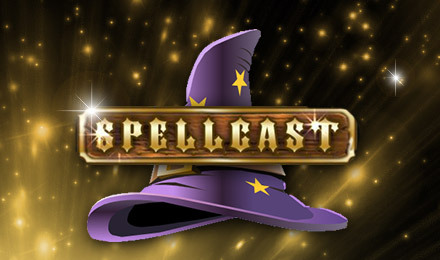 Spellcast is a 5 reel, 3 row online video slots game with 20 paylines, operating on the NetEnt software platform and available on desktop, mobile and tablet platforms. The game is themed around magic and spells, so it isn't surprising to find that the game's wild symbol is a Wizard, and the game's scatter symbol is a crystal ball. Players must set their wager by clicking on the “Coin value” button to change the value of the coins per payline between 0.02 and 0.5. The “Bet Level” button alters the number of paylines that will be active during the spins. “Max Bet” sets the reels to the highest possible bet, and “Auto” sets the reels to spin automatically for a number of spins predetermined by the player. If the player lands 3 or more Scatter Symbols, they will activate the free spins round and receive 15 free spins. During the free spins round, all wins are tripled. Scatter symbols pay the total amount that the player has bet, combined with a multiplier. (Read more about Easy's promotions). The games jackpot is 10,000 coins. Players can access this if they manage to land 5 Wild wizards on any active payline. Well, that covers the features of the game. Spellcast is a fun little game with a nice looking UI (User Interface) and is simply set out. The art used for the symbols is of good quality, and the games animations run smoothly on all devices. Id recommend this game for beginners and seasoned players alike. However, I suggest new players stay away from the gamble feature as it is possible to lose everything very quickly. If you liked Spellcast, you'll also love our Immortal Romance Slots Game. Discover more games on our homepage.